The East Sydney Early Learning Centre was shortlisted to present at the World Architecture Festival from 15-17th November 2017 in Berlin. Andrew presented the project on Day One of the festival and we are very excited to announce that the ESELC took out the category award for School – Completed Buildings. Congratulations to all entries and thank you to the City of Sydney for supporting such an ambitious project! A full list of award winners can be found here. Andrew attended the National AIA Awards in Canberra and ABA’s East Sydney Early Learning Centre was awarded the Daryl Jackson Award for Educational Architecture! It was a joy to work on a project where the ‘delight of the child’ was at the forefront. Thank you to the City of Sydney and all that contributed to the project. Thank you also to the AIA, it is a thrill to be recognised amongst such an esteemed list of entries. Congrats to all! A full list of award winners can be found here. Andrew presented alongside other esteemed architects at the AIA Tuesdays at Tusculum Talk, Designing where we work, love and play. The talk invited select award winners from the NSW Chapter Awards to present their projects through the lens of work, love and play. ABA’s East Sydney Early Learning Centre was awarded this year’s Travel Bursary Award in the Intergrain Timber Vision Awards. The project also received a commendation in the Commercial Exterior Award category. A full list of award winners can be found here. The jury’s citation can also be read here. Andrew Burges will be presenting the East Sydney Early Learning Centre at the WAF 2017 Australian Shortlist Evening next Monday. The event, organised by AJ+C, invites Australian practices with WAF shortlisted projects to present and discuss their shortlisted projects. To attend the event, please RSVP here. ABA’s Brick House has been shortlisted for the 2017 IDEA Awards in the Residential Single category. Winners will be announced at the annual IDEA Gala Party in November this year. A full list of shortlisted entries can be found here. ABA’s East Sydney Early Learning Centre, an adaptive re-use into a 4 level childcare and community centre conceived as conceived as a ‘mini-city’ reimagined at a child’s scale, has been featured on Dezeen. View the link to Dezeen here. ABA’s East Sydney Early Learning Centre, an adaptive re-use into a 4 level childcare and community centre conceived as conceived as a ‘mini-city’ reimagined at a child’s scale, has been featured on Archdaily. View the link to Archdaily here. ABA’s Brick House, conceived as three ‘bridges’ spanning across a base of brickwork, has been featured on Archdaily and Dezeen. View the link to Archdaily here and Dezeen here. ABA’s Brick House has received a commendation in the popular ‘New House over 200sq.m category’ at the 2017 Houses awards at the National Gallery of Victoria on Friday night. A link to the commended projects can be found here. A link to the winning projects can be found here. ABA’s East Sydney Early Learning Centre has been selected on a shortlist of 10 projects globally for World School Project of the Year at the World Architecture Festival award nominations. The winner will be announced in Berlin in November 2017. See the link to the shortlisted projects here. ABA’s Brick House has been selected on a shortlist of 17 houses globally for World House of the Year at the World Architecture Festival award nominations. The winner will be announced in Berlin in November 2017. See the link to the shortlisted projects here. ABA’s East Sydney Early Learning Centre is featured in the Jul/Aug 2017 edition of Architecture Australia. Thanks to Maryam Gusheh for her insightful article. A link the online version of the article can be found here. We were thrilled to receive a residential architecture award for our Brick House at the Australian Institute of Architecture Awards on July 1st. Thanks to our client and builder Shane Green Building for their collaboration on the project. Congratulations to all the award winners. A list of awarded projects can be found here. We were very happy to receive an AIA award for Educational Architecture, and a commendation for Interior Architecture, for our East Sydney Early Learning Centre. Thanks to City of Sydney for their leadership in engaging us to provide a best practice childcare design, and congratulations to the contractor Belmadar for their efforts on such a challenging site. A list of awarded projects can be found here. ABA’s Brick House was the feature project in Belle Property Magazine’s May Issue. Thanks to Margaret Quilter for her thoughtful words. A link to the publication can be found here. ABA and Grimshaw’s Gunyama Park Aquatic and Recreation Centre has received Development Approval. We are now in preparation for construction, which is expected to begin in late 2017. Thanks to all consultants and stakeholders for their input during the design development phase, we are excited to bring this ambitious civic project one step closer to reality! ABA’s Brick House has been shortlisted for the 2017 Houses awards in the New Houses over 200sq.m category. Congratulations to all the shortlisted entries. The winners will be announced on Friday 4th August at the National Gallery of Victoria in Melbourne. A link to the shortlisted projects can be found here. Andrew Burges joined with Will Fung from CO-AP in Hobart to talk on recent work as part of the Brickworks ‘Double Talk’ Series. Andrew focussed on the recently completed Brick House and East Sydney Early Learning Centre, and the upcoming GPARC Park and Aquatic centre. A link to the talk can be found here. ABA’s Brick House has been shortlisted for the 2017 AIA NSW awards in the new Houses category. Congratulations to all the shortlisted entries. The winners will be announced on Saturday 1st July. ABA’s East Sydney Early Learning Centre has been shortlisted for the 2017 AIA NSW awards in both the Interior Architecture category and the Educational Architecture category. Congratulations to all the shortlisted entries. The winners will be announced on Saturday 1st July. ABA’s Brick House has been featured in the December issue of Houses Magazine. See the online version of the article here. Andrew Burges will be talking on formative years in his architectural education, reflecting on the influence of the teaching of Swetik Korzeniewski as part of the Antecedence Series at the Institute of Architects on 10.11 in Sydney and the 17.11 in Melbourne. See the link for the talk here. Andrew Burges will be reflecting on his consultation with the City of Sydney Inclusions (Disability) Panel through the design of the GPARC Aquatic Centre as part of a Preconference Workshop for the 2016 Universal Design Conference. The workshop, entitled ‘Best Practice in Public Facility Design’, will review the success of the COS Inclusions Panel in developing a more human centred approach to Universal Design. See the conference link to the workshop here. The new East Sydney Early Learning Centre for City of Sydney was launched on 30 July. The adaptive re-use of an existing 4 storey industrial building into 60 child places, the launch included speeches by the Lord Mayor and Andrew Burges, as well as lots of family entertainment including DJ, kids face painting, coffee kart and a smoke ceremony by Matthew Doyle. Photos of the day can be seen here. ABA’s Skylight House was featured on Domain in Stephen Crafti’s review of the next architectural styles to look out for. The link to the article can be found here. Australasian Leisure news reviews the ambitious sustainability targets of ABA and Grimshaw’s GPARC Aquatic Centre. Targeted as the first Aquatic Centre to achieve a 5 star as Built Green Star rating, an outline of the project and its sustainability principles can be viewed here. Andrew Burges will be talking on the Future of Aquatic, Sport and Leisure Centres at the 2016 National Sports Convention in Sydney on 23-24 June 2016. See the media coverage on the Aquatic stream of talks here. ABA’s Gunyama Park Aquatic and Recreation Centre is featured in Australia’s Exhibition at the 2016 Venice Architecture Biennale. Curated by Michelle Tabet with Aileen Sage directors Isabelle Toland and Amelia Holliday, The Pool is a fantastic exploration of the role of the swimming pool in the collective experience and construction of Australian cultural identity. See the New York Times review of the exhibition here. The interviews with prominent Australians discussing the different themes or ‘lanes’ of cultural identity can be heard here. The link to The Pool exhibition book can be found here. Our Skylight House was featured in AFR Weekend’s article on storage techniques in contemporary houses. The link to the article can be found here. Our Family and Childcare Centre at 277 Bourke St Darlinghurst was featured in Architecture AU’s news article on new childcare centres by City of Sydney. East Sydney Family and Childcare is due for completion in early 2016. See the link to the article here. Andrew Burges was featured in Sydney University's Alumni Magazine. The article focuses on the concepts and background to ABA's winning entry for the Gunyama Park Aquatic and Recreation Centre international competition. View the online article here. Our family and childcare centre at 277 Bourke St Darlinghurst for the City of Sydney is progressing on site. Due for completion during 2016, the works are being undertaken by Belmadar Constructions. View the City of Sydney link here. Andrew kicked off the University of Queensland Architecture lecture series with a talk on ‘Geography Making’ featuring recent public, competition and residential projects at the . Andrew’s interview with the State Library prior to the lecture is in the link here. A video link of the lecture can be found here. ABA's Skylight House has been included in the US architecture and design online journal Archdaily's editor's choice of the top 50 houses of 2014. See the Archdaily selection here. Andrew participated in a AIA lecture on the Gunyama Park competition, with all five finalists discussing their approach to the competition, as well as the challenges of integrating a major competition into their daily practice. Alex Wilson will be representing ABA at the World Architecture Festival in Singapore. ABA's Pittwater House has been shortlisted in two categories - World House of the Year and World Timber Building of the Year. A link to the shortlisted projects can be found here. ABA, in association with Grimshaw Architects and Taylor Cullity Lethlean Landscape Architects, has been selected as the winner of the Gunyama Park Aquatic and recreation Centre. See the Sydney Morning Herald's article on the competition announcement here and Channel 9's coverage here. Andrew’s article on Harry Seidler’s Gissing House is included in the new book The Forever House: Time-Honoured Australian Homes, edited by Cameron Bruhn and Katelin Butler and published by Thames and Hudson. A link to the book can be found here. ABA’s Skylight House is featured in this month’s addition of Houses Magazine. A link to the online article can be found here. ABA’s Skylight House, exploring a compact single level floorplan complemented by a generous cross section of shaped skylights, has been featured on Archdaily and Dezeen. View the links here and here. ABA’s Skylight House has been selected as a finalist for the Think Brick Horbury Hunt award, celebrating innovation and craftsmanship in the use of brickwork. View the Skylight House and other selected entries here. ABA’s Skylight House wins the best alterations and additions over 200 sq.m award at the 2014 Houses awards. See the jury’s comments here. ABA's Pittwater House has been shortlisted in the World Architecture Festival's residential architecture awards for the best new houses globally in 2014. See the link to the 10 shortlisted houses here. ABA have been selected from 144 local and international entrants as finalists for Stage 2 of the Gunyama Park and Green Square Aquatic Centre Competition. The concept for the project focused on expanding the community appeal of the Aquatic centre by grafting the hedonistic qualities of Sydney’s beach pools into a new urban leisure and wetland landscape. View more of the ABA Gunyama Park entry here. Andrew is giving lecture’s in Sydney and Canberra on his cladding concepts developed for the Pittwater House as part of a Seminar series run by the Timber Development Association. A link to the timing and locations for the talks can be found here. 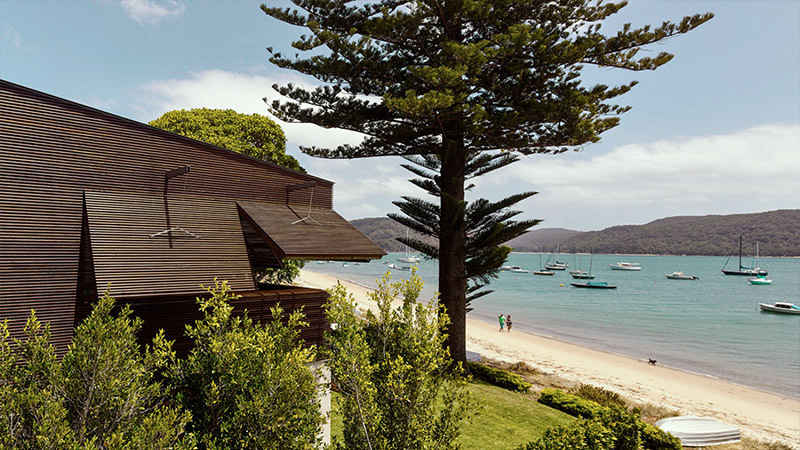 ABA has won an excellence in timber award at the 2013 Australian Timber Design Awards for its custom cladding design for the Pittwater House. Congratulations to all the design winners, who can be seen here. ABA’s Courtyard House was featured in Domain’s review of smart designs for smaller houses. A link to the article can be found here. ABA’s Plywood House at Bondi Beach, developed as a model exploring privacy and light for long narrow sites typical of many inner suburban sites in Sydney, has been featured on design boom. View the designboom link here. ABA won the 2012 Heritage award for its renovation and rooftop pavilion addition to a 1930’s modernist dwelling in Darling Point. A link to all the 2012 winners can be found here. The project can also be found in Issue 87 of Houses Magazine. A detailed practice profile of ABA has been featured in Houses magazine 86. The article by Natalie Ward explores early influences and the evolution of the design approach of the practice. A link to the article can be found here. ABA has been shortlisted for its Australia House competition entry. The competition, for a new artist in residence studio in the rural Japanese Niigata Prefecture as part of Echigo – Tsumari Art Triennale, had 154 entries from around the world. The jury of Tadao Ando, Tom Henigan and Fram Kitagawa awarded first prize to Andrew Burns Architects. See the press release here. ABA’s Harbourside Villas and boathouse are featured in this month’s addition of Houses Magazine. A link to the online article can be found here. ABA has won the 2011 Woollahra Council Heritage Award for our renovation of an interwar functionalist residence at Darling Point. The renovation of the two storey existing building, including a new third level rooftop ‘pavilion’, worked closely with the original intent of the original Nesbitt design while creating an contemporary adaption of the projects guiding modernist principles. ABA’s theoretical proposal for a new model of low scale high density housing has won the 2011 Think Brick award. See all the award winners here. ABA’s Back to Front House is featured in this month’s addition of Houses Magazine. 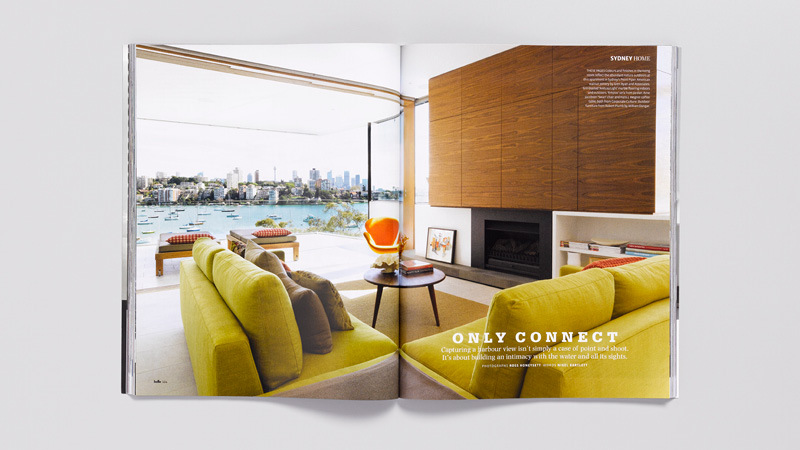 ABA’s Harbourside Villas and boathouse are featured in this month’s addition of Belle. ABA’s Carport Tree-House is featured in Issue 63 of Houses Magazine. ABA’s alterations and additions to a weekender at Palm Beach has been published in Houses Issue 60.